You’ve picked out the perfect bath, the ideal shower and an amazing toilet, but what’s missing? When making renovations or redecorating a bathroom, the washbasin can get overlooked, but it’s just as important as the other ceramics. Though you don’t have to sit on or in it, you may be surprised just how much time you spend using it in an average day. A good basin is both practical and stylish, a focal point for the room. An elegant, modern basin truly makes for a pleasant bath room. Besides, though the standard sink may be enough for most people, there are so many great design options out there which will ensure that all your ceramics match. There’s no point in splashing out for a new bath and having it clash with an ugly sink! With some smart online browsing, you can find discount models that come in all manner of designer styles. When you do decide to spare some room in the budget for a new sink, you’ll probably find that you have more options to consider than you expected. There are several types to look out for and you need to pick one early on, to ensure that your budget stretches and that the room design is consistent. Standing sinks. The traditional form which stands on a column, easy to install. Wall mounted sinks. Fixed into the wall, these are increasingly popular but make sure that the wall can handle the weight. Built-in basins. These are usually mounted into a vanity unit or shelf, creating a great minimalist look that’s also very practical. Under mount sinks. These are recessed underneath a counter top, creating a seamless dip into the sink, with no rim. Semi-recessed basins can also be found, that are only half-hidden. Counter basin. These will sit on top of a counter, showing off the basin instead of hiding it, great if you pick a stylish model. Note that some of these terms are interchangeable, but they make a good starting point for your search. Remember to also consider the tap holes on the sink you choose, which will either have a single or double hole, for one mixer tap of the traditional hot and cold taps. The next step is to look at what the best brands have to offer. 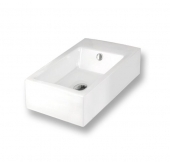 You don’t have to limit yourself to stores on the high street for great basins. Shop around on the internet and you may be surprised how cheap the same items are to buy, even from top brands. Remember to consider what kind of tap set up you want, as you will need to pick a range that also offers attractive single or double taps. Also look at the matching units, for sinks that require support. Most brands have complete sets of matching fixtures within one range. You can start by looking at Duravit, Ideal Standard and Villeroy & Boch. For a great surface mounted washbasin, look at Villeroy & Boch’s My Nature range. This curvy, free standing unit is great for making a statement. 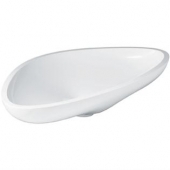 Villeroy & Boch Subway 2.0 offers a compact shape with a quirky off-centre overflow hole. For something bold, Villeroy & Boch also produce a fun bowl-shaped basin for surface mounting in the Architectura series. Ideal Standard are a good choice for simplicity, with a standing corner unit in the Connect range that may solve a lot of space and budget problems. Ideal Standard also produce a more traditional sink in the Strada range, with a single tap and a sharp, box shaped design. 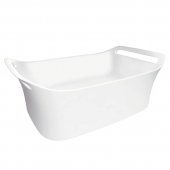 Duravit meanwhile offer a great double sink for busy households in the D-Code range, which includes many other types, all in sanitary white ceramics. Duravit’s Bacino range has a cone shaped surface sink that should prove perfect for a contemporary bathroom scheme. Have a look at Keramag Dejuna for an elegant, wheelchair accessible unit, plus Keramag Vitalis for the same with a convenient, inwardly curved lip. Laufen Alessi offers a conical wall mount in the typical futuristic Laufen style, while Bette are a great choice for seamless counter mounts. Whichever washbasin type you choose for your bathroom, you’ll appreciate washing in style and luxury every day.